Final Fantasy, the name alone is synonymous with so many images. Turn-based combat, beautiful visuals, epic monsters, but fishing doesn’t generally come to mind. 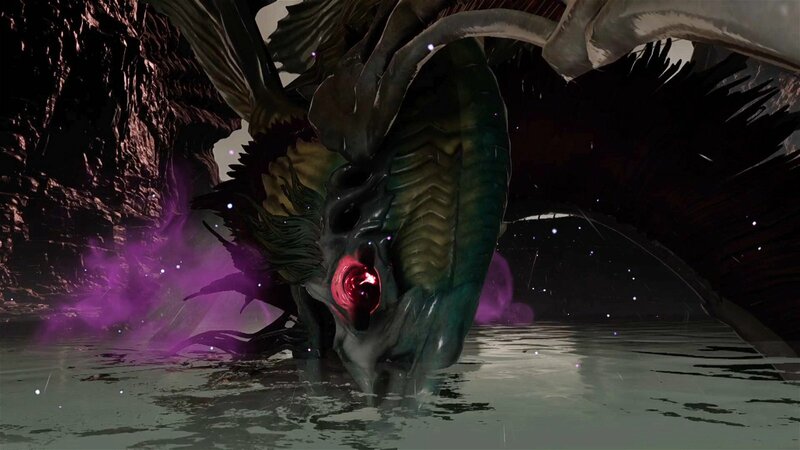 Thanks to virtual reality, Final Fantasy has now tackled fishing with Monster of the Deep: Final Fantasy. 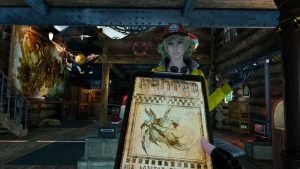 Monster of the Deep is a graphically stunning fishing simulator mixed with a small amount of Final Fantasy XV. I figured I would spend time relaxing, casting out my line and reeling in some fish. A tranquil experience, or so I thought. Players embody Hunters, tasked with hunting Daemon fish. Hunters fish an area until enough non-evil fish are caught to attract the Daemon. Once the Daemon appears, a boss battle will ensue. Players must weaken the Daemon enough with their weapon to capture it. A little unexpected, don’t you think? Done in an attempt to add a little gameplay variety and serving as a basis for the flimsy story, the hunting of Daemons feels out of place in this fishing simulator. 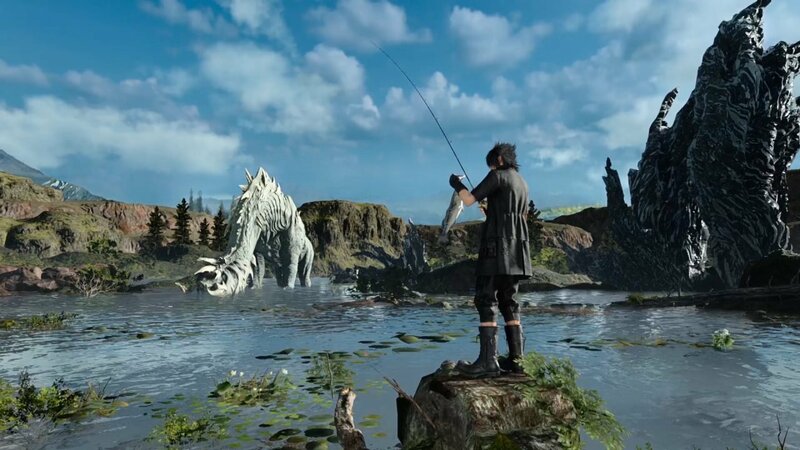 Yes, if there was any fishing simulator that would do something like this, it should be a Final Fantasy fishing simulator, especially to help add that Final Fantasy magical element to the world. However, Monster of the Deep: Final Fantasy XV would have been fine without this mechanic. The atmosphere and characters serve as enough to brand it with Final Fantasy. I was perturbed at first, having my fishing experience so rudely interrupted by a first-person shooter boss battle. A boss battle where death can occur. I died fishing. Fishing! Let that sink it. It was jarring. Yet after the first boss battle, I became more accepting of it, but it feels tacked on. 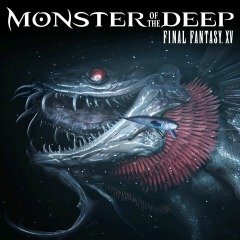 The actual fishing aspect of Monster of the Deep: Final Fantasy XV lured me in. 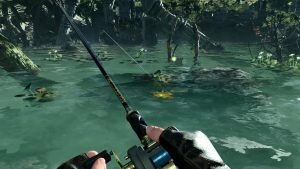 It is relaxing and everything I wanted in a fishing simulator. The physical casting of the line took practice. I would cast directly out in front and my line would veer off to one side. This often related back to the hardware and usually cleared up after recalibrating the VR. I used the PlayStation Move controllers, which made casting more fluid and the boss battles easier, because I don’t want to die at the fin of a fish, again. There is more than just a shallow story mode to Monster of the Deep: Final Fantasy XV. Free fishing is an option for those who just want the relaxing experience of fishing. I spent a great deal of time in Tournaments. Tournaments can be won by having the heaviest fish, catching certain kinds of fish, or the total weight of things caught. I say “things” because my mad fishing skills caught me a boot. 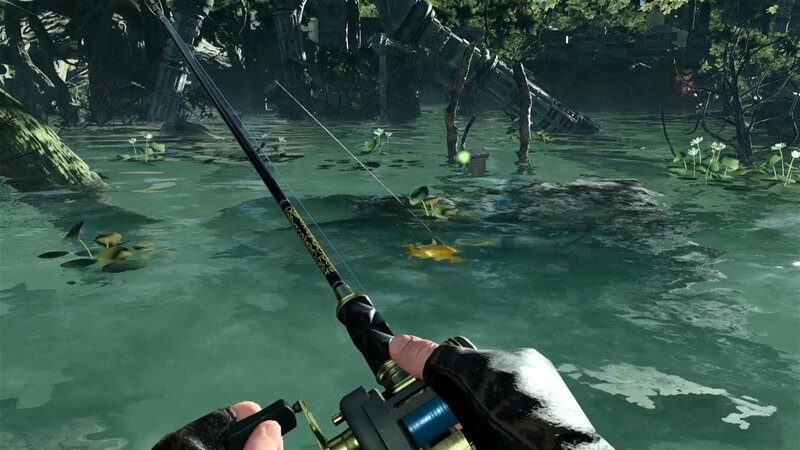 Players can also take up hunts to target a specific fish. Hunts and Tournaments can earn Gil, which is used to purchase new outfits, poles, lures, reels, and lines. How aboot that? 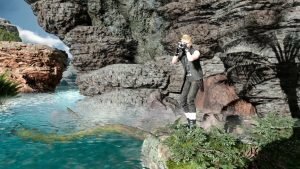 The surroundings of Monster of the Deep: Final Fantasy XV are picturesque and allowed me to minimally explore the landscape of Eos. The graphics lend themselves well to a Final Fantasy title. Beautifully rendered yet still colourful enough to remind players it is a fictional world. The environment is littered with mystical creatures of Final Fantasy. 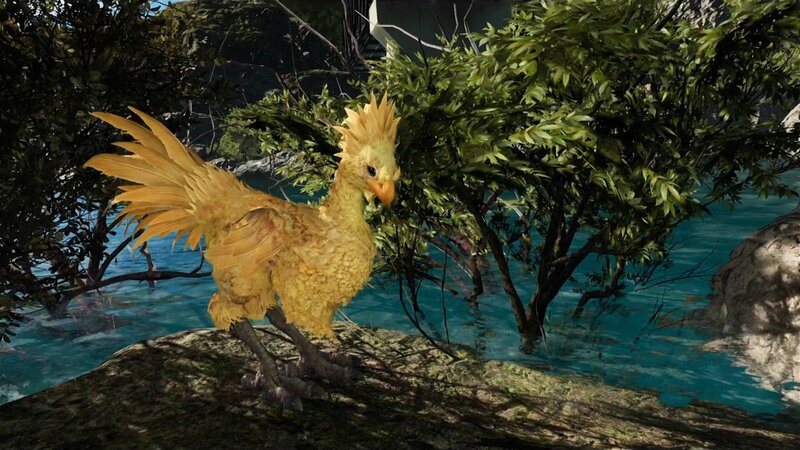 I spent some time fishing while kicking it with a Chocobo. I often found myself fishing with some familiar faces from FF XV. For Final Fantasy fans, these limited interactions will be satisfying as it is mainly just fan service since they serve no narrative purpose. 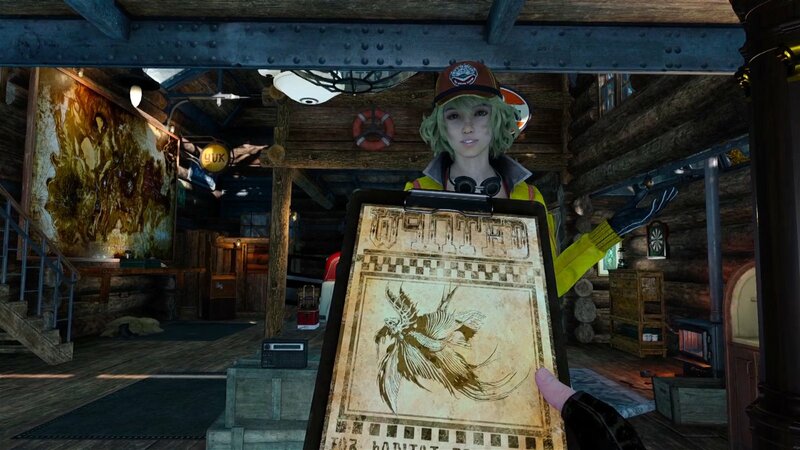 Although there are points in the game where I am sure Square Enix was attempting to titillate me with Cindy. I mention this because I have yet to experience a VR title that made me feel that uncomfortable observing a character. The sounds of Monster of the Deep: Final Fantasy XV are sufficient. I have little to complain about except for the minimal conversational abilities of the AI. My time with Noctis and his buddies was short when fishing yet I would hear them repeat the same lines over and over again. If there had been more variety in their casual conversation it could have really added to the immersion. In casual conversation, humans don’t tend to repeat themselves, unless they are drunk. Liked this article and want to read more like it? Check out more of Melanie Emile’s reviews such as Cuphead, Plants Vs Zombies: Garden Warfare 2, and Until Dawn! Final Fantasy XV dives into fishing with the not so deep sim Monster of the Deep.